This works as good as playing gif files directly in the browser but offers advantages such as smaller file sizes. The highly popular image hosting and viewing service Imgur introduced the Gifv format some time ago. Animated gifs uploaded to the service are automatically converted to the format and since it is a mp4 file at its core, it is reducing the file size of the gif significantly. Imgur today launched the next chapter: a Video to Gif conversion service that supports hundreds of different video sites. 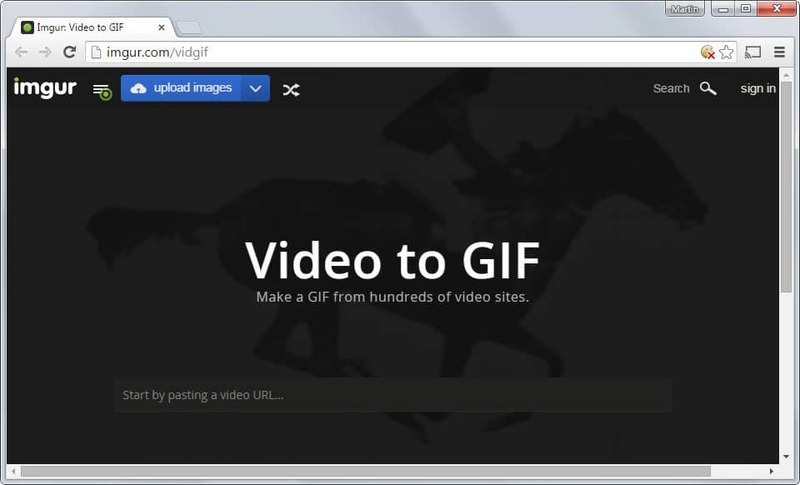 Paste a video url into the form on the start page of the video to gif service. Select the start and end time with the help of a slider that is displayed underneath the video. Add a caption to it as well if you want. Click on create gif and wait for the process to complete. The conversion may take a while depending on the video source and interval that you want turned into an animated gif. The resulting video is automatically hosted on Imgur where you get the usual sharing and display options. If you want to know how this looks like, check out this Imgur page. Video to Gif is currently available on the desktop version of Imgur. I have tested the feature with various video hosting sites including YouTube and Vimeo and all that I tested worked just fine. As far as limitations are concerned, there are some however. The animated gifs cannot exceed 15 seconds playtime for example, there is only room for one caption and you cannot change the output resolution at all. Imgur's Video to Gif service is not the only service that is tapping into the niche. There is Gif YouTube for example which works only on YouTube, Giphy which is a search engine for animated gifs and Gfycat which turns animated gifs into mp4 files. Imgur launched its Video to Gif conversion service today that you can use to turn videos hosted on sites like YouTube or video into animated gifs. It’s a shame the img tag doesn’t support HTML5 video since there wouldn’t be any need for GIFs, websites like gfycat and we could also use H.264 for compressing photos (like the BPG image format).